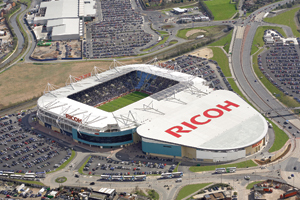 Ricoh Arena has announced plans for a multi-million pound expansion of its events centre in 2010. The £3m expansion will begin in January and is due to be complete before June. Included in the investment is the addition of three halls at the Coventry venue. A 650-seat auditorium and 2,500sqm of events space will be added to the existing 6,000sqm Jaguar Exhibition Hall. The Jaguar Exhibition Hall will also be enhanced by a new entrance, boosting its capacity to 10,000 visitors. Ricoh Arena chief executive Daniel Gidney said the development would allow individual events held at the venue to be self-contained. "The economic downturn has meant many of our competitors are cutting back but we are confident our investment will lead to further business and put us in pole position when the recovery starts," said Gidney.